Grotta Palazzesse is a famous cave restaurant in Polignano a Mare on the Adriatic sea. This is the most romantic place in the world to have a meal with someone you love. The views are magnificent. You will remember this for the rest of your life. We spent a morning touring the old center of Polignano a Mare and then had lunch in this fabulous restaurant. We were so lucky to get a table at the edge overlooking the sea. You feel fabulous as you sit at your table sipping a glass of good wine. As you enjoy your wine, you look down to the sea and see boats below you entering and exiting the cave. Come join us in this great restaurant and see the views we saw. If you are lucky enough to be in this area of Puglia, make a reservation here and experience it yourself. There are many small independent nations in Europe. Most are in Italy. 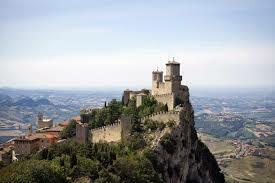 The Vatican City is the most visited but George loves San Marino. The world seems to let these small entities alone. They are independent sovereign states. San Marino is inside Italy but Italy has no control over it. There are no boarders or customs. You just drive in like any other city. Most tourists don’t even know they left the country Italy. It is officially known as The Republic of San Marino. It is only about 64 sq miles in size and has a population of about 32,000. George gave a lecture here many years ago. The countryside was beautiful. It was very quiet except for the chirping of birds. There are good highways most of the way from Bologna. Then mountain roads up to San Marino. He remembers the food was good and the people were friendly. The people here are Italians and speak Italian. If you enjoy small mountain towns, this is an area not to be missed. The Adriatic sea is close by but the roads detour around the mountains. Enjoy!